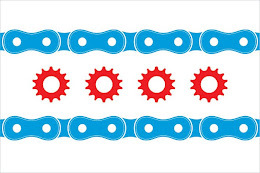 As members of the Illinois bicycling community, we are always deeply saddened when a fatal bicycle collision claims the life of a fellow Illinois bicyclist. When that fellow bicyclist is a child, words cannot adequately describe the level of devastation that pulses throughout the bicycling community. Four year old Jayden Jacobo died tragically in a bicycle collision on the afternoon of Monday, July 29, 2013 near the 2300 block of East Oakton Street in an unincorporated portion of DesPlaines in Chicago's northwestern suburbs. Just prior to the collision, Jayden exited a private driveway onto East Oakton Street on his way to visit his aunt in Arlington Heights along with his brother, sister, and mother. Jayden was riding his bicycle while his mother walked next to him pushed a stroller. Upon exiting the driveway, Jayden's bicycle collided with the rear axle of a semi-trailer truck. Jayden's mother rushed to his aid along with the driver and passenger of the truck, but Jayden's injuries were too severe. He died at the scene of the accident of blunt force injuries. To date, no citations have been issued. However, news reports do not report as to whether any evasive action could have been taken by the semi-trailer truck prior to impact or any other details of the collision. According to the Chicago Tribune, Jayden was weeks away from turning five but had already mastered riding his bicycle without training wheels. His aunt Alma Jacobo told the Tribune that Jayden was looking forward to being baptized on his birthday this month and was set to start kindergarten in the fall. His family is understandably absolutely devastated at the loss of the little boy they describe as "the most cheerful person in the world." Our absolute deepest sympathies are with Jayden's family at this extremely difficult time.